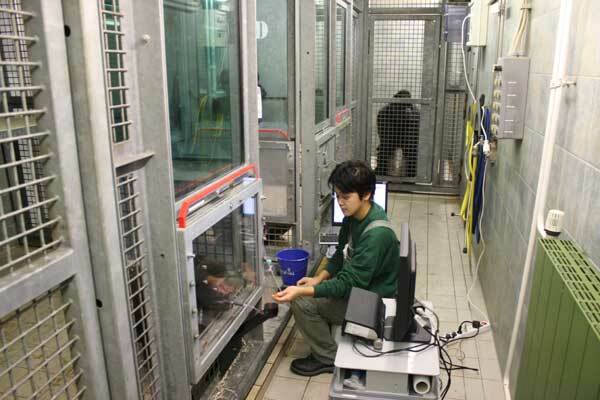 In this study, at the max-plank institute, Germany, we attempted to record the eye movements of two ape species, orangutans and gorillas, following the method of previous study in chimpanzees (Kano & Tomonaga, 2009, 2010). We successfully recorded all the individuals we tested, 10 orangutans and 5 gorillas. A difficulty in ape eye-tracking is that we are not able to restrain the head of ape, unlike monkey or human eye-tracking. Therefore, in this study, we used an eye-tracker that has a wide-angle lens, which allows the subjects to move their head relatively freely. In addition, we attached the tube and nozzle to the panel, which separate the apes from experimenter. The nozzle produced grape juice little by little. 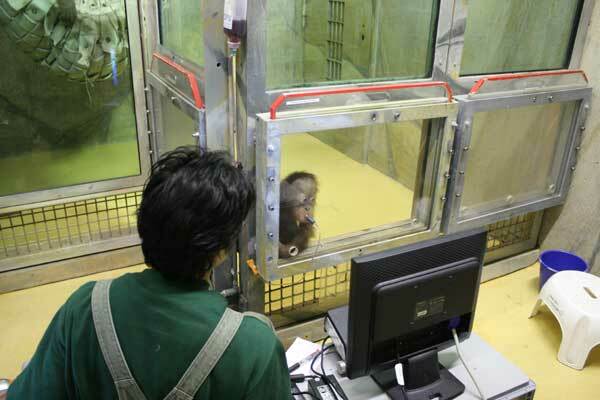 Apes kept sucking the juice (and thereby kept their head still nearby the panel) while they freely viewed the pictures presented on the monitor. These methods enabled us to record the eye movements of apes non-invasively and opened many possibilities of future studies.